1 afternoon-early night. An exclusive evening to chill out on a real desert sunset, watching the sun go down from the top of a dune. Have dinner, watch the stars and look for small animals on the way back. Feel like spending one night under the stars? Check our Dunes & canyons and Ocean sunset packages! 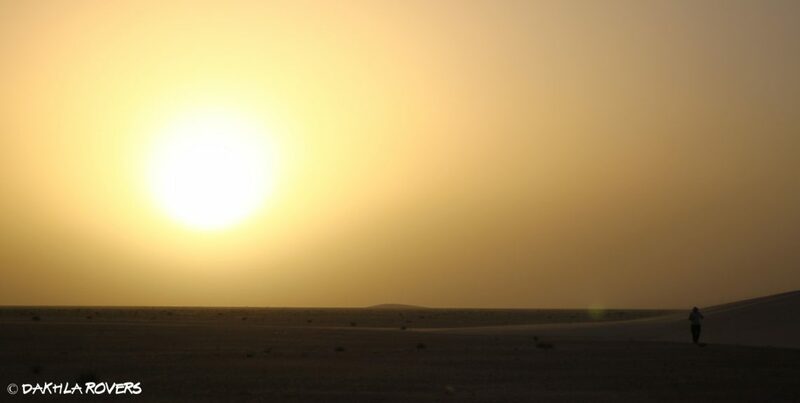 We will leave Dakhla in the mid afternoon and arrive to the first dunes before sunset. You’ll enjoy your dinner (choice between seafood, meat or vegetarian menus) while the sun disappears behind the horizon, then look up to watch the stars. We’ll be spotlighting on the way back, scanning the desert with powerful lights to look for small animals like fennecs, hares, foxes, gerbils, geckos and so on. We’ll be back to your hotel by 1:00 in the night maximum, for a good sleep before your next day in Dakhla begins. The tour begins at your hotel in Dakhla, in the afternoon, and ends at your hotel around 1:00 in the night of the same day. Dinner is included in the offer, with choice between seafood, meat or vegetarian menus to be made upon booking. Price: 1-2 pax = 320 Euro; 3 pax = 380 Euro. Prices for desert tours depend on several variables, including length of itinerary and number of guests. Our itineraries are fully customizable and suitable for individuals, pairs and small groups up to 4-6 people – ask us for your tailored trip!